Wow, I’m getting behind on my blog! 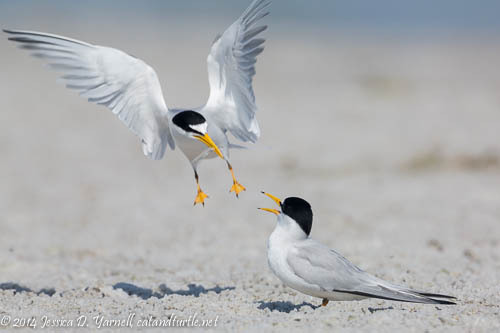 There’s just so much to see and shoot in Central Florida during springtime and nesting season. 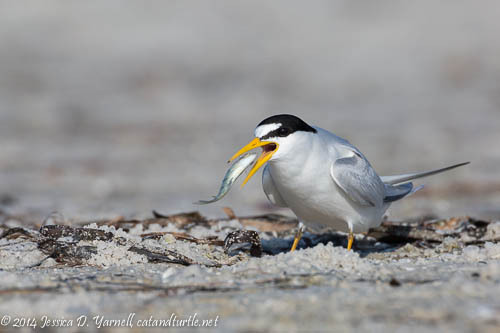 These pictures are from two weekends ago at Fort De Soto, when I spent a fun morning observing Least Tern fish exchanges and courtship rituals. The birding at North Beach has been spectacular for the past couple of months, and this morning was no exception. It was so much fun. I sat in the nice warm, shallow water (to get the best light on the birds in the morning, it’s often necessary to get wet!). For most of the time, I was the only one there. The birds didn’t care a tweet about me, since I wasn’t moving and I wasn’t a threat from the water anyway. 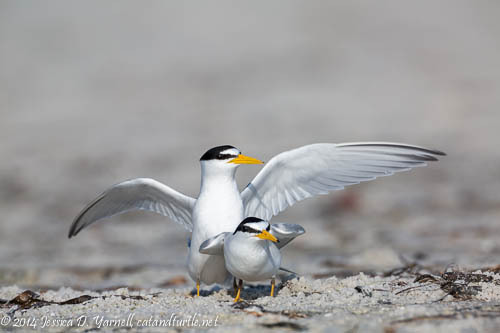 At first I just had a flock of gulls, but then these two little Least Terns flew in. They were courting, so there was lots of action to keep me entertained. I ended up spending almost the whole morning photographing just these two little creatures. 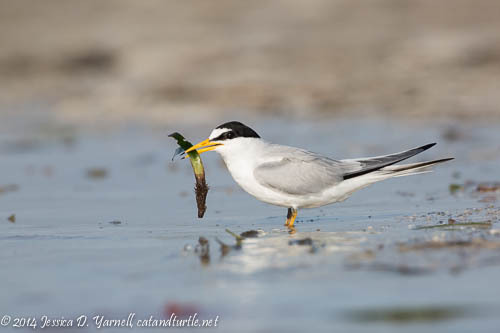 The courtship ritual begins when the male brings a fish in for his mate. She stood on the beach, watching him dive for her breakfast. I loved how I’d often get her tongue out as she called to her mate, urging him to hurry up. Finally, her mate caught a nice fish and brought it in for his sweetie. Her calls got louder and louder as he flew in! I was so annoyed at myself for clipping the wings on this shot! It’s a bit challenging to photograph the fish exchange, as it happens really fast. 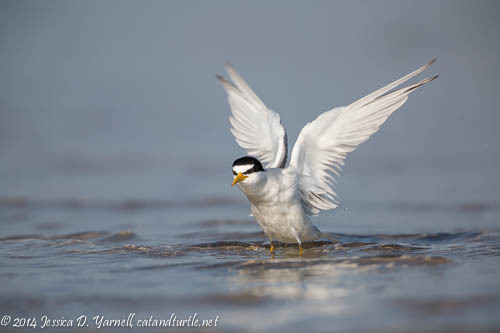 You’ll be focused on the female, who often runs to meet her mate as he flies in. It can be tricky to get the camera panned over fast enough! This was one of the few exchanges where he flew in at a nice angle. Silly birds. They exchanged at least five or six fish while I watched, and it was so exciting to try to capture the handoff. Speaking of the exchange, apparently it can be on dry land or in the water! 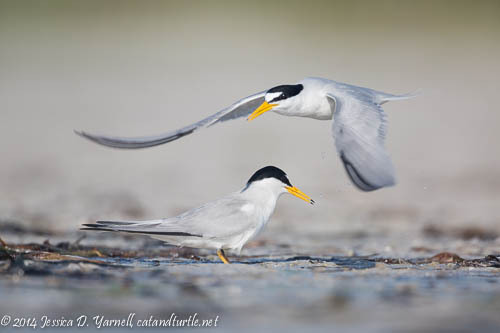 This tern seemed to have given up on her mate. She waded into the water, splashing around and calling to him. At one point she picked up a piece of seaweed, as if to say, “Gee whiz, do I really have to go searching for my own breakfast! ?” But then he brought her another fish, so I guess he was forgiven! But sometimes she would hang on to it for a few seconds. I was surprised to see how much she tossed it around in her beak. I guess she had to orient it just right for the fatal gulp. Or sometimes she’d really play with her food! I took this little video early on in the morning. The male brought in a fish, and the female stood tossing it around for about a minute. She even dropped it, then retrieved it. All these courtship rituals lead up to a mating between the birds. 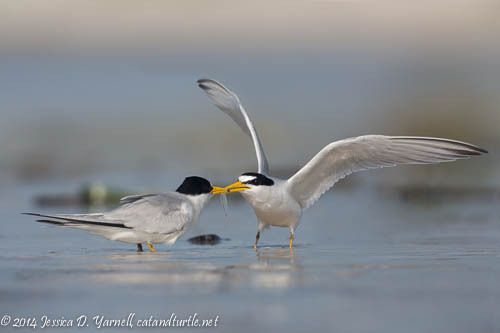 I’d never observed the Least Terns mating, and it was very interesting to see. After a fish exchange, the male positioned himself behind the female. Now if they were gulls, he’d hop right onto her back and proceed without any hesitation. 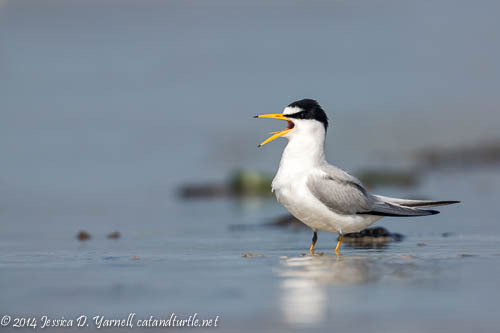 But the terns seemed to be a little more dignified. They started to do a little dance, flapping their wings and shaking their heads as they both called to each other. I was mesmerized behind my camera. They did this dance for so long that I got tired of stills and flipped to video mode! I was certain that they were going to mate, but I guess the timing wasn’t right. After they danced and danced, the female wandered down to the water. The male followed her, and they took a bath together. So I got to end my morning with these two beautiful birds with some great splash shots and wing flaps! 1) I was there before the birds came. They approached me, not the other way around. 3) After I left, they followed me to the next patch of beach! Another great day! Beautiful images. I hope they stick around this week for me!